What happens when a reporter who knows nothing about The King of Fighters XII dares to take a meeting about it? Here at Kotaku we try to expand our horizons. And sometimes our horizons are expanded for us, like when I drew the assignment to meet with Ignition Entertainment at E3 last week. I was ready to play their pretty side-scrolling Muramasa: The Demon Blade and, what do you know, I previewed it. Then, my former colleague in games reporting, Ignition's director of business development, Shane Bettenhausen, welcomed me to try King of Fighters XII. Me, the guy who lost in Street Fighter II to Soulja Boy. I let Shane play. I asked questions. Tell me, I requested, what someone who doesn't know anything about The King of Fighters XII should know. From my notes: Fighting game (obviously). All hand-drawn. The artwork for each character, rendered in 720p, took 18 "man-months" to complete. Lighting was faked by drawing different sprites for the characters depending on where they stand in the playfield. Three-on-three fights, as is tradition. Not much of a story in this one, and a pared down roster. All dream matches. Oh, Shane said, something else: did I see this character he was playing as? Ash Crimson? That's the main character. He asked me to guess Ash's gender. No. Male. The King of Fighters series, I was told, has been progressive with introducing characters with alternate lifestyles, like cross-dressing. "It seems that most fans are warming up to him," Bettenhausen said of Ash, "Even though he looks like a girl and wears his hair in a bob." So progressive are the developers of The King of Fighters — and so impossible is it to erase the inquisitiveness from a journalist even after they cease being paid to be a journalist — that Bettenhausen told me that he asked the new game's developers at SNK Playmore to clarify the sexual orientation of those characters for whom such a thing may have been ambiguous. The evil (naughty?) secretary Mature? Bisexual. This guy Shane was fighting in the game named Benimaru, who Bettenhausen pointed out wears a halter top, fingerless gloves and flicks at his tall head of hair when he wins he fight? "Apparently he's a hit with the ladies," Bettenhausen told me. "He has tons of girlfriends." Interesting. I didn't dare play the game. Time was short and I needed to get to more Muramasa. But now I know a little more about The King of Fighters. Enough to make me curious, for reasons I didn't expect. 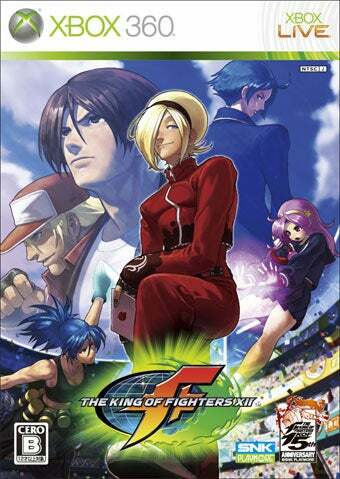 The King of Fighters XII is out in July for the Xbox 360 and PlayStation 3.